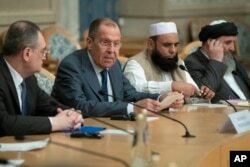 Participants of the conference on Afghanistan including representatives of the Afghan authorities and the Taliban speak to journalists in Moscow, Russia, Nov. 9, 2018. 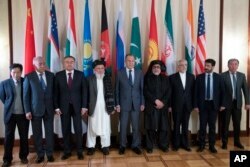 Russian Foreign Minister Sergey Lavrov (C) poses for a photo with the participants of the conference on Afghanistan bringing together representatives of the Afghan authorities and the Taliban in Moscow, Russia, Nov. 9, 2018. Meanwhile, the Russian effort was the latest sign of the Kremlin's growing role as a powerbroker — a role Russian officials seemed to relish as the U.S.-led NATO military operation in Afghanistan, 17 years and counting, has struggled.